We love St. Patrick's Day around here. 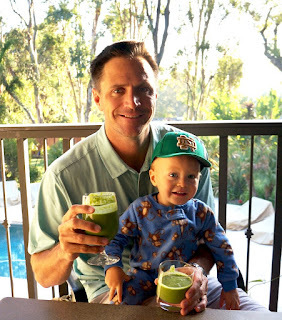 It's a such a fun holiday, we love all things green, and it's Adam's birthday! It's also my one of my best friend's birthdays, so I'm a big fan of this day. 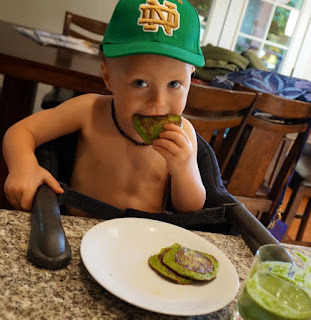 We had a fun morning celebrating daddy and eating green pancakes and drinking shamrock smoothies! I posted a similar version of these pancakes recently on my Instagram but today I'm doing a grain free version. Easy, clean and Rio loves them! 1. Heat about a tablespoon coconut oil in a skillet. 3. 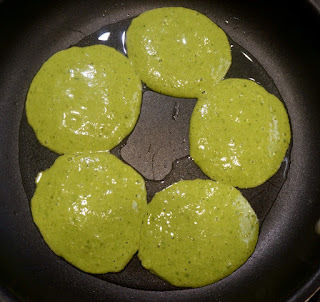 Pour mixture into small circles in pan and cook through. Prior to our pancakes we drank our daily smoothie. 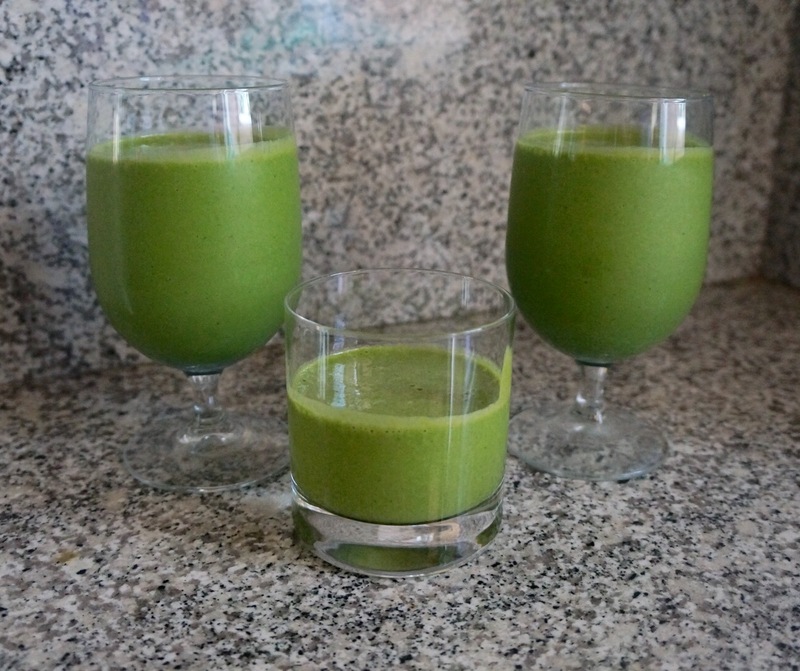 This is a typical smoothie we drink every morning but today we will call it a Shamrock Smoothie! 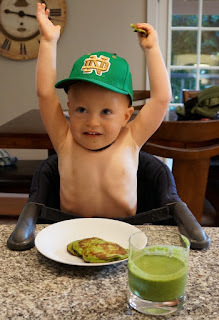 You could make these recipes for lunch or even dinner for your little leprechauns. Later today I'm going to try to make my own paint and do a fun little craft with Rio. I will add that activity to this post too! Also looking forward to having a date night with my husband to celebrate his birthday! Rio just turned one and a half! 18 months is a really fun age. He's so curious, determined, and gets excited about everything. Most of the time I just let him explore, create and navigate the way when it comes to playing. He loves being outside and is really good at having fun with just a little space to explore, a ball or even just some rocks. We go to the park and the Botanic Gardens often and he has such a great time just doing his thing. 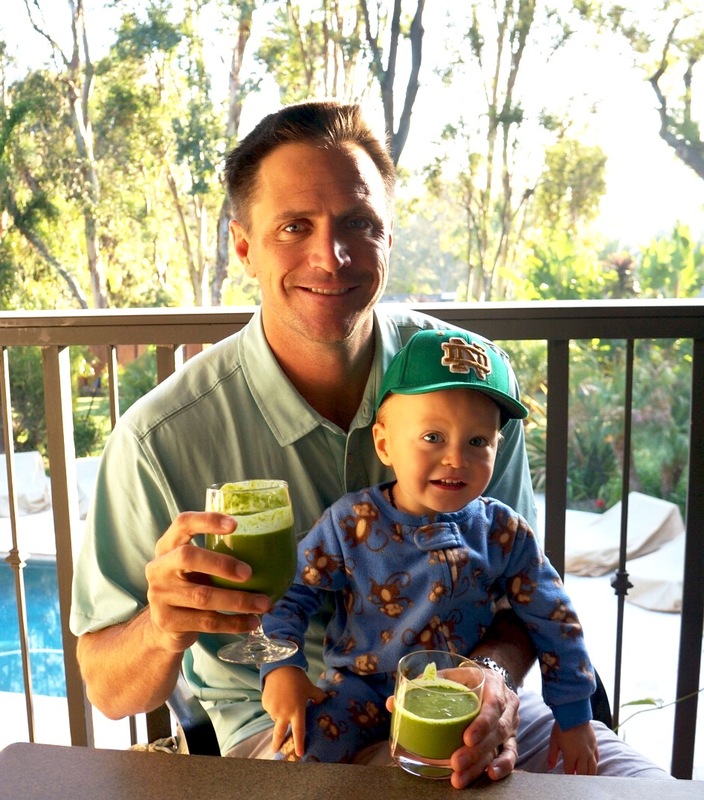 He has quite a few indoor activities he's starting to enjoy as well, so I thought I'd share some of his favorite things of the moment. He has recently become really into puzzles. 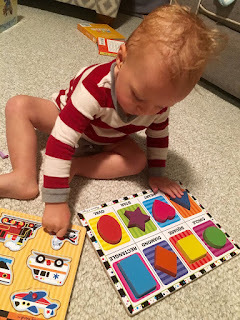 Amazon has some great chunky wood puzzles and peg puzzles, which help with fine motor skills. This shape sorter cube is also high on his list of faves. 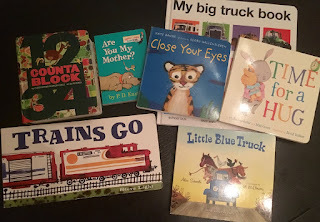 He also really loves books (we go to the library to check out new ones every week or two). I've pictured a few of his favorites. Rio really love vehicles and anything with wheels, so of course he loves his dump truck. One of his very favorite things to do is playing outside in rocks, sand and water, so I have buckets and shovels for him. Since he loves rocks, I've already started working on concepts like sorting, numbers, opposites, and big to little. 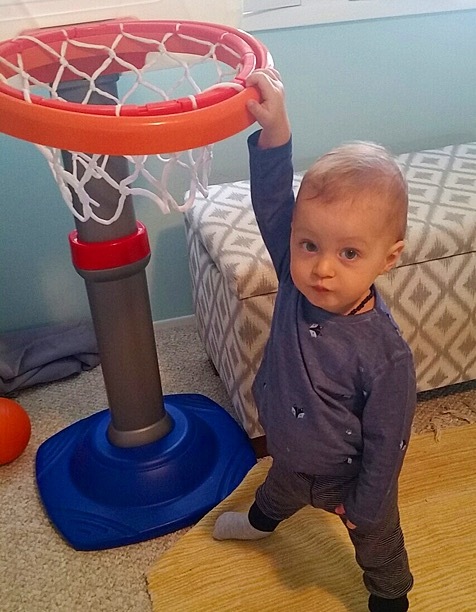 He loves his Fisher Price basketball hoop and golf clubs. Rio really enjoys music and playing his Instruments. He is starting to show interest in drawing and coloring, so we have a roll of paper and crayons. Bubbles are a great thing to have for playing outside and they are a good way to develop hand eye coordination by having your baby try "catch" them. I also have different types of balls on hand (tennis balls, small basketball, volleyball) to work on gross motor skills like catching and kicking. It's good to have a variety of activities available at this age because they are so active! 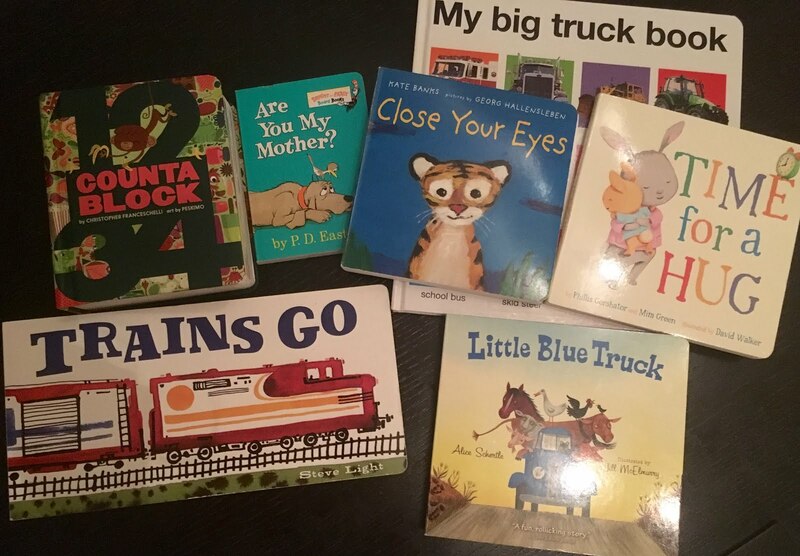 I try to set out different things everyday and I keep puzzles, art supplies, and certain books out of his sight and reach so that when I get them out he is more interested. What are some of your baby's favorite activities?